Everyone's seen THAT guy. Maybe as you are driving through a small town, you catch a glimpse of him on a street corner. Or maybe you even saw him at a protest for human rights. Yeah—the guy who is holding up the giant sign that says John 3:16: "For God so loved the world that he gave his one and only Son, that whoever believes in him shall not perish but have eternal life" (John 3:16). Easy right? We just need to have faith in the eternal, ineffable, all-good God-Man, and we'll be alright…right? Well, that’s a bit of Protestant nonsense. James 2:19 says that "even the demons believe in God and shudder". That's right, just believing in God (and His son), places you in the same category as the demons. What differentiates us from the demons is our response to Christ’s sacrifice. The demons slander it, and saying to the Son of Man "Go away! What do you want with us?". They want nothing to do with Christ, and will do everything in their power to set themselves up as masters of our lives in place of Christ (1 Cor 10:20). We on the other hand, are called to participate in it. Recall the patriarch Isaac, who prefigured Christ’s sacrifice by being enjoined in the eternal Passion by his Father’s devotion. Just as Isaac the innocent son of the righteous Abraham was to be sacrificed, so we too can make sacrifices of ourselves that allow us to participate in Christ’s eternal redemptive sacrifice. So what is our response to Christ's sacrifice? To enjoin in Christ's sacrifice and in doing so be united to Him. The apostle Paul calls us to this vocation. He rejoices in his own crucifixion saying: "I have been crucified with Christ and I no longer live, but Christ lives in me" (Gal 2:20). Later in the same epistle he speaks of bearing the wounds of Christ on his body (Gal 6:17) as a testament to his devotion. But what does this mean for us? It is in our faith in Christ’s triumph over Hades that we can endure all trials that are thrown at us. In weathering the tempestuous realities of life, we find that our egos are humbled, our appetites chastened, our minds sobered, and our hearts purified of the passions. Though it may seem impossible not to be destroyed by our crosses in the midst of bearing them to the hill of the skull, it is only when we arrive there that we find, we were not carrying them alone. 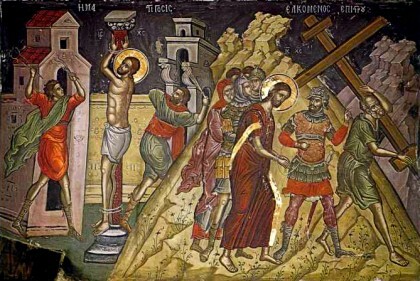 In choosing to walk with Christ to Golgotha, we find that Christ is there with us, perhaps in the kind words of those who are watching our journey, or in our own Simon of Cyrene. For some this cross might be a sacrifice in life, a great discomfort, for others it might be physical death. Though we see ahead of us the mount of the skull, we are not terrified, for we know the Resurrection. In His Passion, His Sacrifice, and His Resurrection, we are emboldened to continue our walk, our little passion. "We must sacrifice ourselves to God, each day and in everything we do, accepting all that happens to us for the sake of the Word, imitating his passion by our sufferings, and honoring his blood by shedding our own. We must be ready to be crucified. Let us cleave to and emulate the life-saving Passion of Christ in our lives.